The compilation and reporting of municipal performance measurement and benchmarking results provide valuable information for monitoring City operations, assessing how well Toronto is doing and supporting resource allocation decisions. Public reporting of performance measurement and indicator results, supports accountability and transparency of municipal service delivery as well as providing a tool to help assess the quality of life of Torontonians. Toronto’s performance measurement results are examined and reported from an internal perspective, by reviewing multi-year trends, as well as from an external perspective by benchmarking results against other municipalities. The scope of the performance measures and indicator data included in the Toronto Progress Portal will continue to evolve as additional data and information is developed and becomes available. A significant improvement to the Progress Portal website is the implementation of the interactive dashboard. This new tool allows for enhanced visualization and better user experience of the indicators presented on the City’s website. 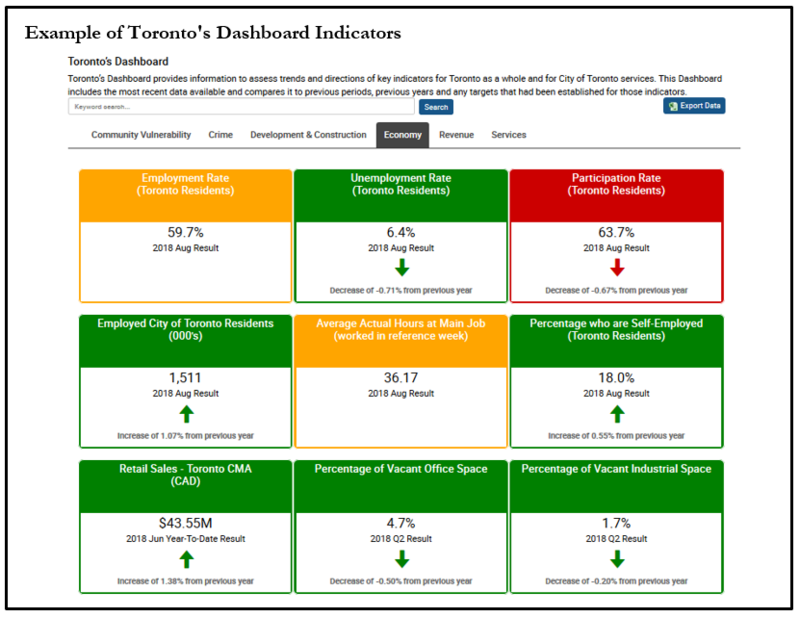 Toronto’s Dashboard is an interactive, online Dashboard that can be used to assess trends and directions of key indicators for Toronto as a whole and for City of Toronto services, in areas such as economic and social indicators, key city revenue sources, crime rates and other divisional statistics. Toronto’s Dashboard provides modern analytics capabilities and uses data visualization tools to convey data and information to users through a unified visual display. The Dashboard represents a vast improvement regarding user experience over the previous Management Information Dashboard, where results were presented in a static PDF report. Wellbeing Toronto is a mapping application that displays downloadable datasets at the neighbourhood level. It also provides a display of services and facilities in the City, such as schools, community centres, and libraries. There are multiyear datasets which allow users to view trends and comparisons to the data at the neighbourhood level. Wellbeing Toronto was developed to meet the needs of a variety of users from decision-makers that need data to support neighbourhood level planning; residents that want information to understand better the communities they live, work, and play in; and to businesses needing indicators to learn more about their customers, or planning their business. It provides a “common fact base” to users so they can make more informed decisions based on a set of reliable data. Wellbeing Toronto is both a data visualization tool as well as public information participation tool. It enhances transparency by providing data as part of the City’s Open Data Strategy. Raising the Village is a child and family well-being outcomes and indicators project lead by Children’s Services and the Toronto Child & Family Network. Raising the Village gathers shared population level data (for children and families with children aged 0-12) collected by key data sources such as the Toronto District School Board’s Student and Parent Census and Offord Centre’s Early Development Instrument. This data and information is used by community organizations to design programs to improve outcomes and reduce inequities, and by governments to make evidence-informed policy decisions that improve the lives of children. Raising the Village includes many tools to better understand the data and to apply it to planning and policy making. These tools include an interactive neighbourhood comparator dashboard, disaggregated demographic data and infographics describing the top 5 challenges facing children. Data and tools are continually updated and added to Raising the Village. The City’s Open Data Portal provides access to City data made available to be freely used, reused, and redistributed by anyone, anytime and anywhere while also ensuring that the data released meets privacy, security, and legislative obligations. The City has consistently published on average 25 to 30 datasets per year and currently has a total of 291 datasets and over 1,300 datafiles available. A new Open Data Portal was launched in 2018, and the migration of all existing datasets to the new Portal is underway. Releasing Open Data improves the City’s delivery of public services, engagement with citizens in government decision making, and innovates our approaches to civic problem solving. A stable foundation and substantial investment in open data is a key contributor to the success of strategic initiatives like Smart Cities, Civic Innovation, and Open Government. The City’s Open Data Master Plan provides a strategic framework and roadmap for the City to advance Toronto’s vision for open data until 2022. The plan will enable the City to grow as a leader in open data through effective governance, alignment to the International Open Data Charter, open source development and a move to coproduction. It provides visibility into how open data helps meet the needs of Torontonians and how the City plans to unlock its potential. The plan also shows how, and when, the community can best align with the City to leverage open data. MBNCanada is a collaborative effort of 17 Canadian municipalities. In addition to Toronto, other members include the Cities of Calgary, Durham, Greater Sudbury, Halton, Halifax, Hamilton, London, Montreal, Niagara, Regina, Saskatoon, Thunder Bay, Waterloo, Windsor, Winnipeg and York. MBNCanada examines municipal performance in 36 different service areas encompassing approximately 600 activity level indicators and performance measures relating to efficiency, customer service and community impact. To ensure comparisons of results between municipalities are as accurate as possible, MBNCanada uses a standardized full-costing methodology and follow detailed technical definitions. Toronto staff participate on 36 service-specific expert panels with their colleagues from the other MBNCanada municipalities to establish performance measures and associated technical definitions, compare results and share different approaches and practices used in local service delivery. Using the results from MBNCanada, Toronto also produces a local report, which focuses on Toronto’s quartile rankings and comparing the results of the other MBNCanada municipalities as well as Toronto’s own internal historical trends in results over 10 years. The WCCD is comprised of 62 certified international cities, which in addition to Toronto, includes other major cities such as Los Angeles, Boston, Melbourne, London, Barcelona, Amsterdam, Johannesburg and Taipei. This program is coordinated through the Global Cities Institute at the University of Toronto. Toronto reports on 100 indicators on service delivery and quality of life. Toronto’s 2015 and 2016 Global City Indicator results were submitted in September, and are currently being reviewed by an ISO auditor for compliance with ISO 37120 to attain certification. The WCCD and its ISO-certified indicator data sets provide an opportunity for Toronto to expand and complement on the current benchmarking done with Canadian cities to include larger global cities. City staff monitor key international city ranking studies conducted by third parties such as the Economist Intelligence Unit, KPMG, Mercer’s. These studies show that Toronto consistently ranks as one of the top cities in the world, with a high quality of life and high levels of economic competitiveness.